FILE - Ninh Binh Power Plant, which is a coal fired power plant to supply electricity, is seen in Ninh Binh Province in Vietnam, Sept. 19, 2007. The Asian Development Bank agreed Friday to loan Vietnam nearly $1 billion to build a coal-fired power plant as the booming country scrambles to keep up with its surging demand for power. 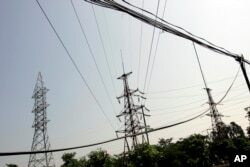 Vietnam is facing a power dilemma, with officials in Hanoi trying to figure out how to supply all of its surging energy needs without destroying its environment in the process. Southeast Asia in general will see energy use jump 80 percent in the next two decades, according to Trilliant, a software firm for electricity grids. But for Vietnam, that number is closer to 200 percent. Some stakeholders believe the remedy is a combination of technology, renewable power, and greater energy efficiency. But the answers aren’t so simple to decision makers in Hanoi. FILE - Power lines are seen in Ninh Binh Power Plant, which is a coal fired power plant to supply electricity, in Ninh Binh Province in Vietnam, Sept. 19, 2007. Many of them see coal as an affordable fuel for the economy, with dozens of thermal power plants slated to come online by 2030, despite the carbon pollution they discharge. And although Vietnam just raised the price it’ll pay investors for solar power, the market for renewable energy has remained in its infancy for years. Vietnam faces the predicament familiar in developing countries: Economic growth comes at a price. “The world has engaged in the industrial revolution 4.0, featuring the deeper penetration of information technology into all aspects of life,” said Vo Van Hoan, office manager at the Ho Chi Minh City People’s Committee. That’s the good news about technology, that Vietnam is taking part in this revolution in its quest to be an industrialized nation by 2020. But the bad news, Hoan said, is there are downsides to globalizing economies, such as pollution, deforestation, desertification and other damage linked to climate change. Technology isn’t always eco-friendly as it ushers more factories and heavy machinery into Vietnam, where electronics have overtaken rice and coffee as a leading export in recent years. Technology, though, also could mitigate an economy’s harm to the environment, especially in addressing the energy supplies that Vietnam considers essential to move up the income ladder. An example is electricity meters connected to the internet, or smart meters. Trilliant and the Saigon Hi-Tech Park wrapped up a pilot project in March deploying smart meters around the commercial zone that houses the likes of Intel and Samsung. The devices alert authorities when there’s a power outage, so they can fix it and keep the grid running smoothly. The meters can detect tampering and measure power quality. And they capture data every 15 minutes, so that people can analyze their electricity consumption in real time and make decisions about the most efficient use of energy, rather than wait on a monthly bill. That means officials aren’t the only ones thinking about public utilities. Nguyen Ba Quynh, public sector director of Microsoft Vietnam, said ordinary people must get involved, too. If this sounds lofty, it’s because Quynh was discussing what Vietnam could learn by peeking across the Gulf of Thailand at Singapore. The tightly managed island has a “Smart Nation” campaign that pushes tech-driven improvements to the quality of life, such as a “zero waste” dream of converting refuse into energy. Another common application of emerging technology is to assess traffic patterns, which can lead to optimal fuel use. In Singapore’s case, the government simulates various arrangements of mixed-use real estate to see the impact on traffic, said Chinn Lim, lead public sector strategist at Autodesk, which makes software for architecture, engineering, and manufacturing. Based in Singapore, Lim said his company is also consulting with Vietnamese government agencies to cut energy waste. For example, designers can reduce cooling costs depending on how they situate a building to take in sunlight. Lim also said it’s becoming trendy for buildings to be retrofitted with more efficient lighting, such as LED bulbs and lights that can be programmed to dim or shut off on their own. Smart bulbs and smart meters might offer just incremental change, but with more power blackouts expected in 2018 as demand beats supply, Vietnam needs all the progress it can get.